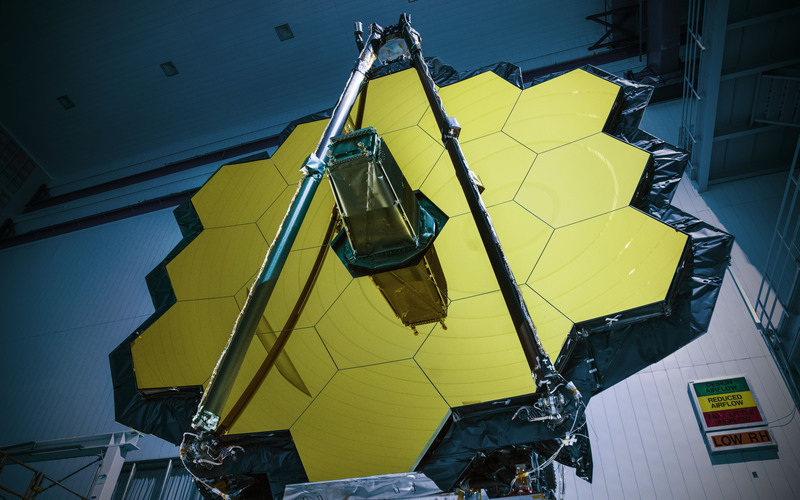 NASA’s James Webb Space Telescope (JWST) successfully completed the center of curvature test, a crucial optical measurement of the telescope’s primary mirror prior to cryogenic testing, and the final test at NASA’s Goddard Space Flight Center in Greenbelt, Maryland. The spacecraft will be shipped to NASA’s Johnson Space Center in Houston for more testing. JWST will experience high levels of noise and vibration during the rocket launch that will carry into space. Engineers at Goddard tested the space telescope in vibration and acoustics test facilities that simulate the launch environment to ensure that functionality is not impaired by the stresses of a rocket ride into space. Optical engineers set up an interferometer, the main device used to measure the shape of the telescope’s mirror, both before and after the environmental tests. An interferometer records and measures the ripple patterns that result when different beams of light mix and their waves combine or “interfere”. Waves of visible light are less than a thousandth of a millimeter long. The optics on JWST must be shaped and aligned even more accurately than that to function properly. Using lasers to measure the mirror’s shape prevents physical contact that could scratch the mirror. By measuring light reflected off of the optics using an interferometer, scientists are able to measure extremely small changes in shape or position that may occur after exposing the mirror to a simulated launch or temperatures that simulating the subfreezing environment of space. Temperature and humidity conditions in the clean room were kept incredibly stable during testing to minimize fluctuations in the optics over time. To compensate for the tiny vibrations that remained, the interferometer is a “high-speed” one that takes 5,000 frames per second, a faster rate than the vibrations themselves. This allows engineers to subtract out vibrations and get clean results of any change in the mirror’s shape. “Some people thought it would not be possible to measure beryllium mirrors of this size and complexity in a clean room to these levels, but the team was incredibly ingenious in how they performed these measurements and the results give us great confidence we have a fantastic primary mirror,” said Lee Feinberg, Webb’s telescope optical element manager. The JWST will be shipped to Johnson Space Center for optical testing in a vacuum at extremely cold temperatures. Then the spacecraft will go to Northrop Grumman Aerospace Systems in Redondo Beach, California, for final assembly and testing before launch in 2018.